Please be kind. This review is written by a sixth grader and is her own personal opinion. I really enjoyed this book. As a kid I understand what Nate is going through. He likes to shop alone just like me. 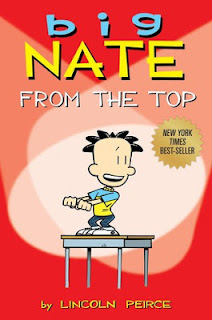 Big Nate and his dad, the teacher, his friend and Sheila, they are the characters in this book. This book is really cool. I love it. This book has a lot of action, like all the time. It is like a comic book. This book is really, really, really, funny. It's setting takes place at a school, at home and in a clothing store. This book was fun to read. I cannot wait to show this to my brother. The reason why is because he is just like Nate. he is at the school with his friends talking to them and in detention. He is outside talking and playing and he is at the clothing store for school shopping. If this isn't enough information for you then please read the books and fine out more.